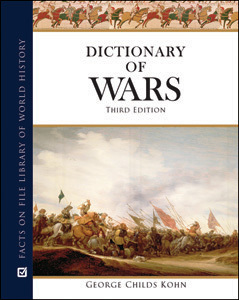 Dictionary of Wars, Third Edition contains detailed summaries of all notable wars from throughout history, spanning more than 4,000 years. This volume is an authoritative source on the global conflicts, civil wars, mutinies, punitive expeditions, undeclared wars, rebellions, and revolutions that have occurred throughout the world. Facts are presented in a lively and engaging manner, and the scope of the book is truly impressive. Approximately 1,850 entries are extensively cross-referenced to help readers find the information they want. This book deals exclusively and concisely with military information, often specifying political, social, economic, and cultural influences on military operations. "The entries are succinct and well written. This impressive volume is recommended for public and academic libraries."